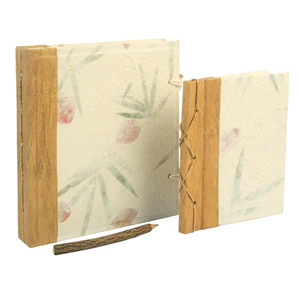 Using natural materials, the saa paper artisans craft by hand a beautiful set of album and journal. 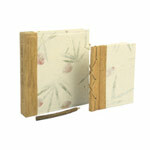 The pages and covers are made with sustainable saa (mulberry tree) paper. The covers feature bougainvillaea petals and bamboo leaves below their surface. The album pages feature photo corners. They can hold 72 (size 15.0 cm W x 10.0 cm H) horizontal photos. The notebook contains 25 blank pages. The graphite in the pencil does not go the whole length, only approximately 2 cm. Materials: Mulberry paper, tamarind wood, raintree wood, bougainvillaea petals and bamboo leaves.